To earn a decent return going forward, how reliant on multiple expansion are buy and hold investors in the S&P 500? Let's take a look at one measure. 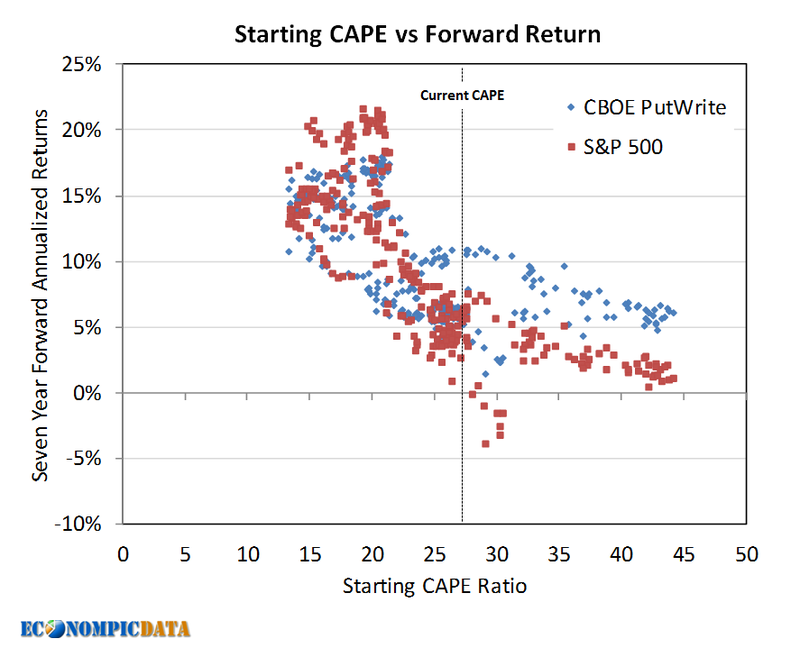 The first chart plots forward 10-year returns for the S&P 500 at various starting 5 point "CAPE" valuation buckets (i.e. less than 10x P/E all the way through above 30x) against the change in the starting P/E relative to the P/E in ten years (i.e. 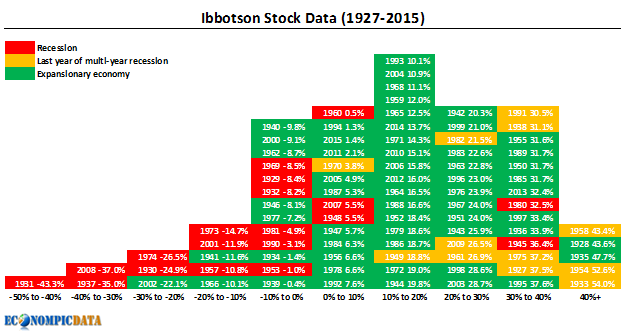 whether the P/E multiple expanded or contracted) going back to Ibbotson data inception in 1926. 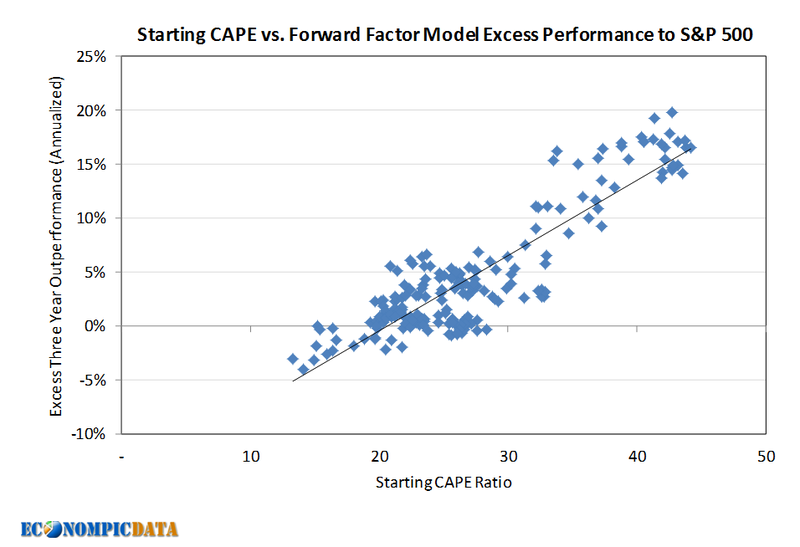 The chart shows the strong relationship between forward performance and the change in the multiple, as well as the impact of the starting valuation (the cheaper the starting valuation, the higher the returns and the more likely the index will exhibit multiple expansion, whereas the more expensive the starting valuation, the lower the returns and the more likely the index will exhibit multiple contraction). 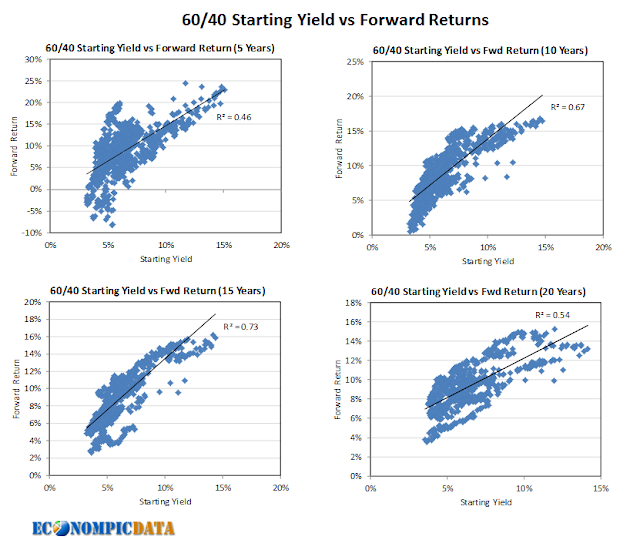 The next chart plots the same information, but uses forward real returns (i.e. adjusted for inflation). It is interesting to see the tight convergence of returns during periods of P/E multiple contraction irrespective of starting valuation, indicating that some of the decent nominal returns during contractionary periods in the first chart at lower starting valuations occurred during inflationary environments (mainly the 1970's). So where do we currently sit... at the current 28.3x CAPE, decent forward returns will require the multiple remaining elevated (or becoming more elevated) as no change would equate to a roughly ~4% real return in the model. 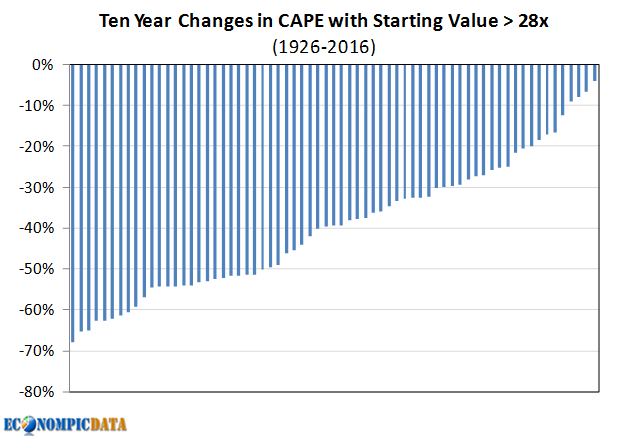 While no change is certainly a possibility, the below chart shows the CAPE has declined in all previous 67 ten year periods since 1926 when the CAPE was greater than 28x, with an average and median decline of around 40% (which would take us right back to the historical average of ~18x), which at the current valuation models out to a roughly 0% real return over 10 years. None of this is a sure thing, especially over the short-run. 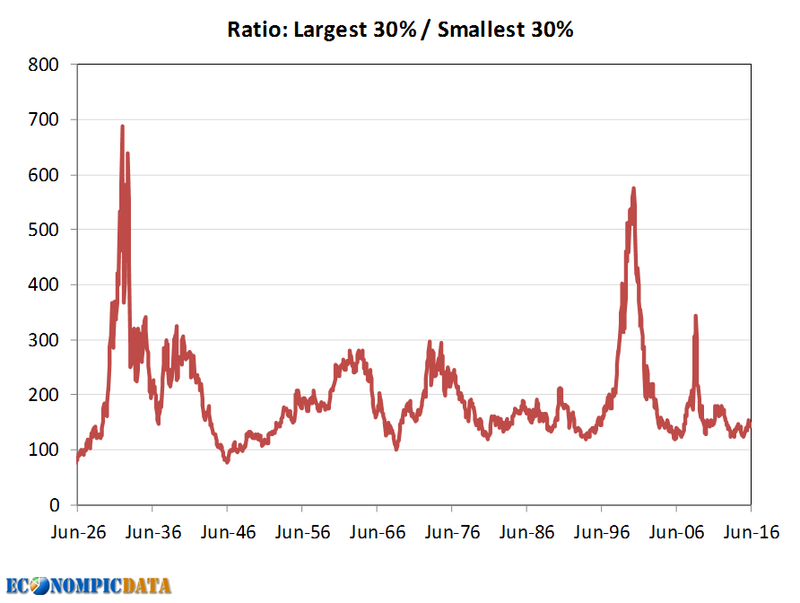 Despite being expensive three years ago, the S&P 500 has returned 10% annualized since. It just happened to have benefited from moving from the 15th percentile of most expensive CAPE to the 6th most expensive. 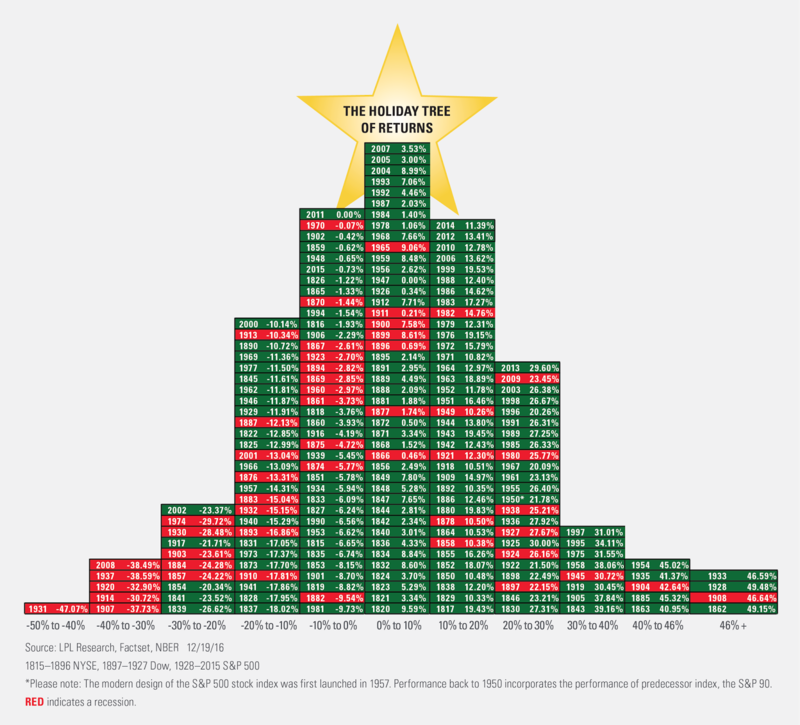 While it absolutely can get more expensive from here, that's simply not the long-term buy and hold bet I would want to make when there are cheaper opportunities available outside and within the U.S..
ETF Trends (hat tip Josh) showed the following "quilt" of large cap factor calendar year returns in the post Low Volatility is Not a Buy and Hold Strategy. 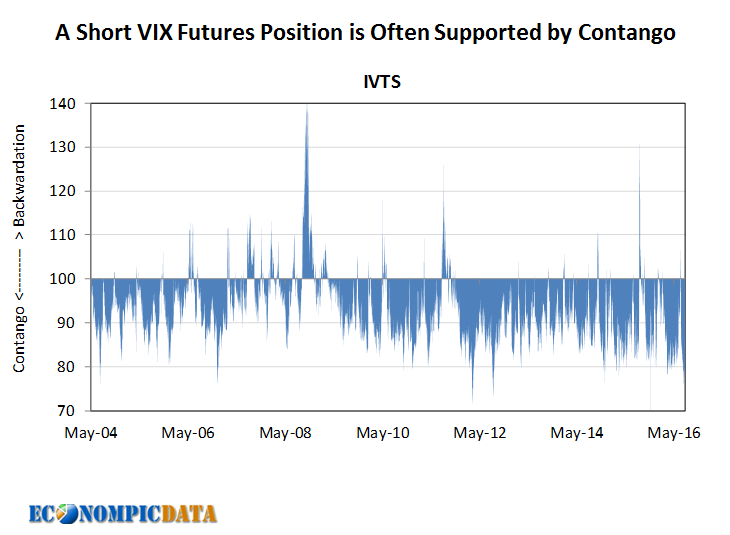 It is reasonable to conclude that low volatility is not a buy and hold strategy. 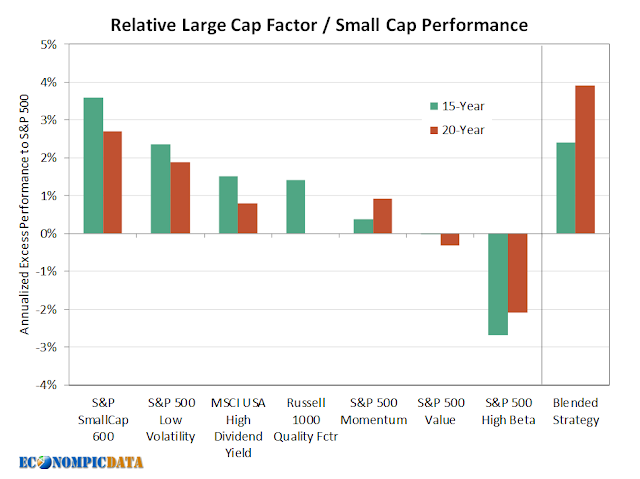 This is not because it is unlikely to outperform over the long term, but rather because few investors are likely to survive multiple years of underperformance. Recent months have witnessed money flowing out of the low volatility and minimum volatility ETFs. Is this money flowing into different factor ETFs, or is it moving back to the market cap-weighted ETFs? Rather than abandoning factors during their periods of underperformance, investors may want to consider the opportunities that exist in factor blending and in factor rotation. I agree completely and in this post I'll outline one potential framework to allocate to factors that diversifies across a few approaches and across time. Update: following my publishing of this post I received a comment that a lot of the work in the below was built out in further detail in a white paper by Ronald Balvers and Yangru Wu titled Momentum and Mean Reversion Across National Equity Markets. I recommend anyone interested in the framework to take a deeper look there. 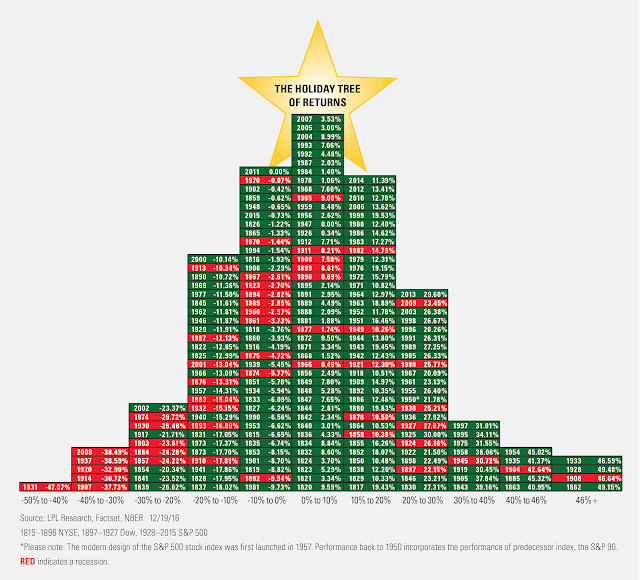 I swapped out the S&P 500 Dividend Aristocrat Index for the MSCI USA High Dividend Yield Index; the issue with the S&P 500 Dividend Aristocrat Index for this analysis is that it has a size tilt (it's equal weighted) and a momentum / quality tilt (it holds companies that have increased dividends every year for the last 25 consecutive years built in as well). Neither are a bad thing at all, just not the pure dividend exposure I want for this analysis. Similar to what was outlined in the ETF Trend piece, certain factors had more favorable long-term returns over 15 and 20 years (small cap, low volatility, momentum, and high dividend), while high beta and value (of all things) weighed on performance (note that the Russell 1000 Value Index outperformed the S&P 500 Value Index used in the analysis by 100 bps, which shows that getting the factor right may not be enough if you get the implementation part wrong - but I'll save that for another day). 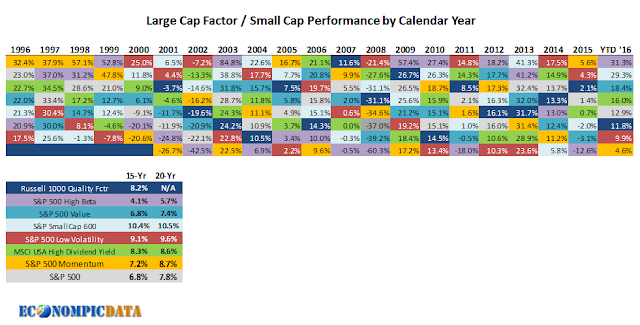 The below shows the updated factor quilt. Note the quality index only went back 15 years, hence the blank 1996-2000 data. FACTOR ROTATION: MOMENTUM OR MEAN REVERSION? YES AND YES. 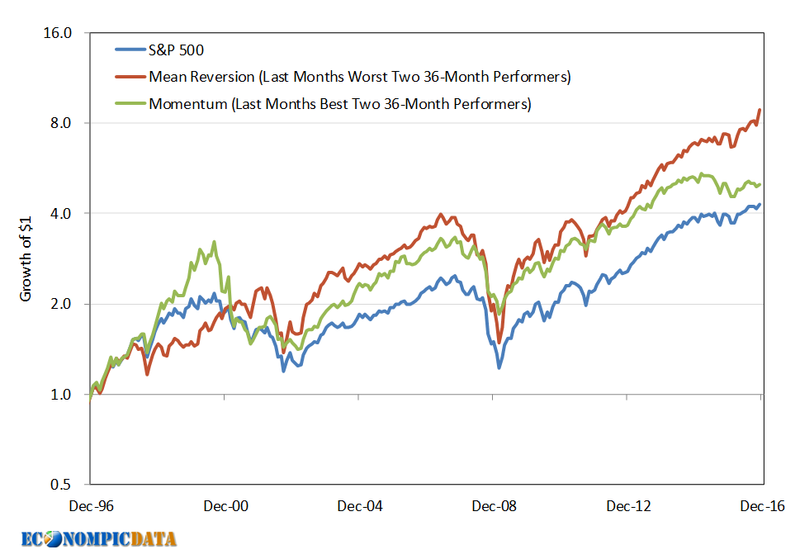 Momentum tends to work better over shorter periods of look back periods (6, 9, 12 months). 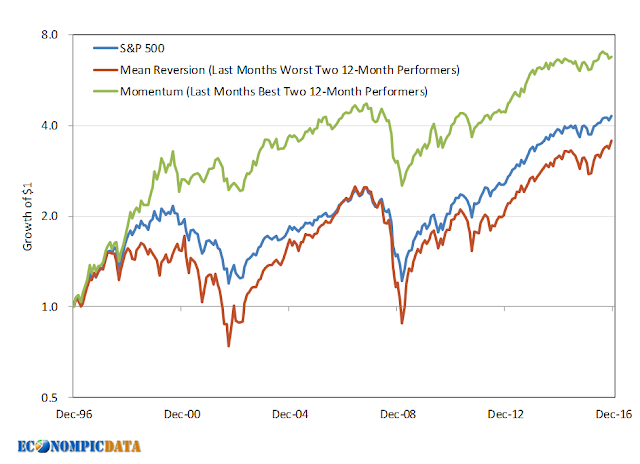 The chart below shows momentum and mean reversion using 12-month returns for the indices and one can see that momentum outperformed over the longer time frame. That said, note that almost all of the outperformance came in the first 10 years as a relative momentum strategy was able to cruise through the dot.com bubble. Mean reversion on the other hand tends to work better over longer look back periods, in part because valuations tend to matter more over longer time frames (while sentiment is a shorter term signal). We can see that momentum continued to outperform the index over this twenty year period, but not nearly to the extent it had using a shorter signal. 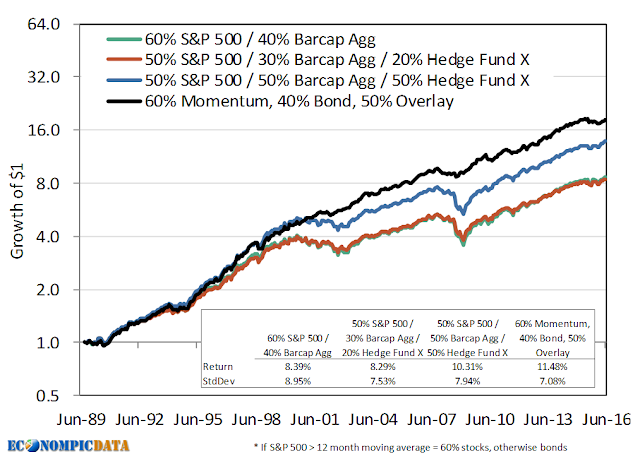 Given momentum works better over shorter periods and mean reversion works better over longer periods, we can combine the two to diversify allocations by the momentum factor and by time. 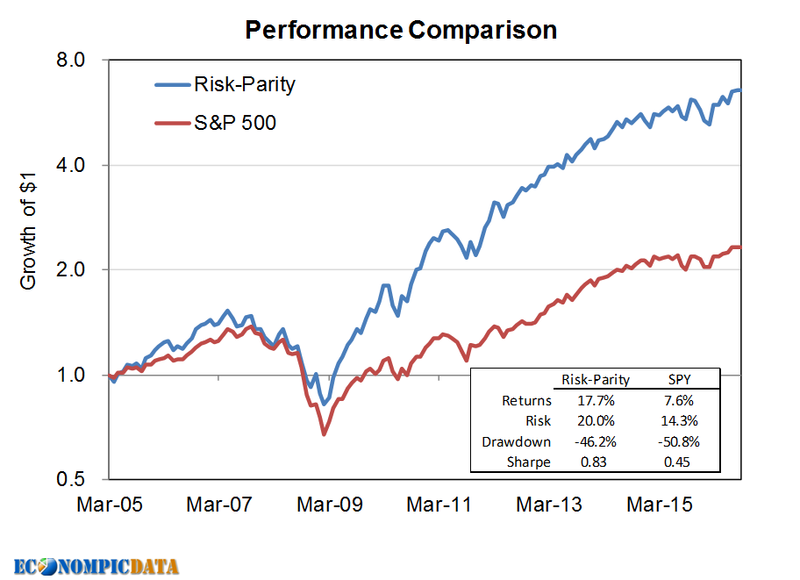 The result is a portfolio with similar returns, but much more consistent tracking to the S&P 500 (tracking error goes from 9.5% for mean reversion and 8.3% for momentum, to 5.8% for the combination). 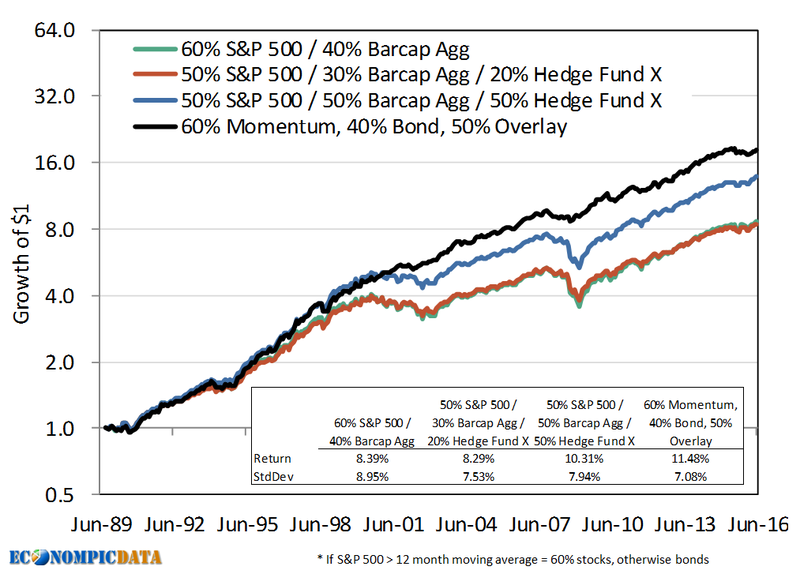 Taking it one step further, the below adds cash as an allowable asset class for momentum (i.e. 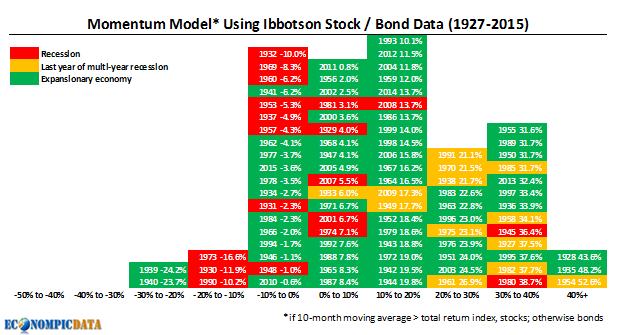 an allocation can only occur if the twelve month return outpaced cash), turning momentum into a more absolute return oriented strategy (mean reversion continues to exclude cash as an asset class). There are still shorter periods of time in which the blend will underperform, but the blended strategy (with the ability to go to cash) has provided consistent outperformance over three year periods (85% of the time over the last twenty years). 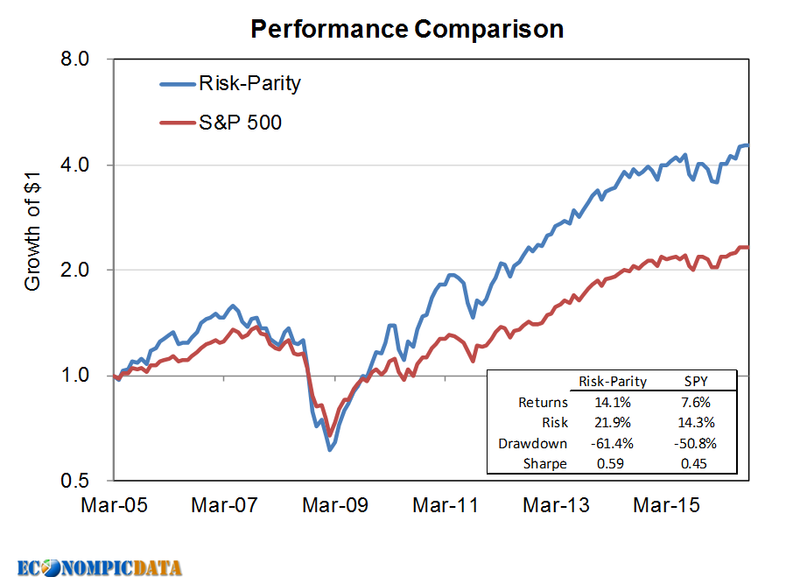 In addition, the relative performance has tended to have a linear relationship with starting valuation (i.e. it tends to outperform going forward when stocks appear relatively expensive) in part because of the ability to move to cash in the case of momentum and in the likelihood of allocating to a less frothy segment of the U.S. stock universe in the case of mean reversion. 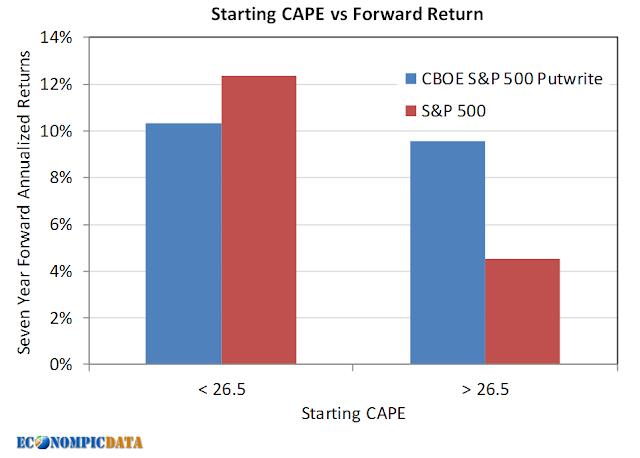 Something to keep in mind given the current cyclically adjusted P/E "CAPE" has crossed 27x. 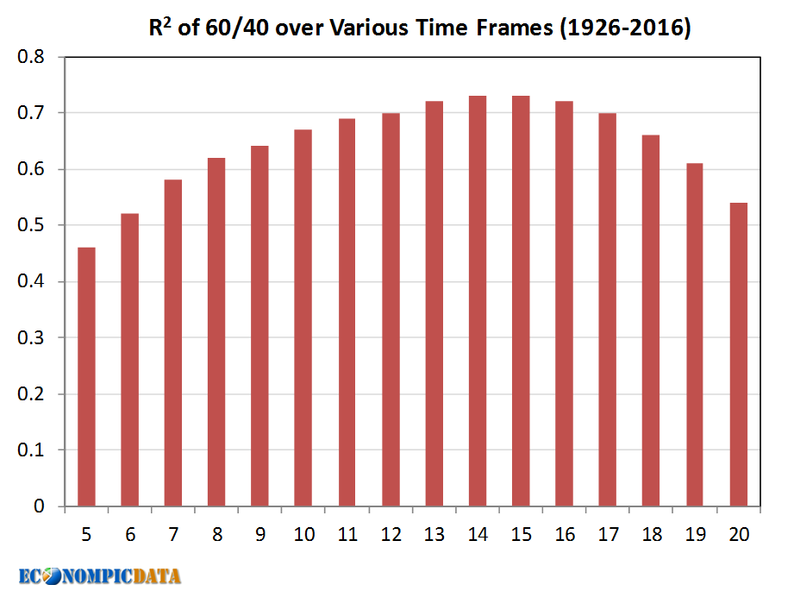 Certain factors have shown the ability to outperform over longer periods of time, but can and do underperform over shorter periods. 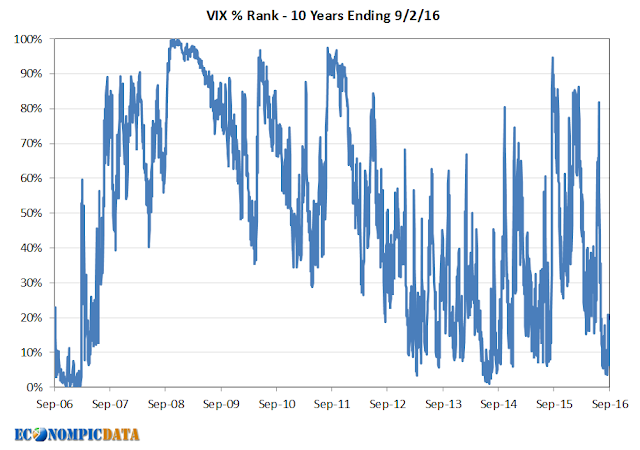 These periods can be challenging for investors that cannot remain disciplined. 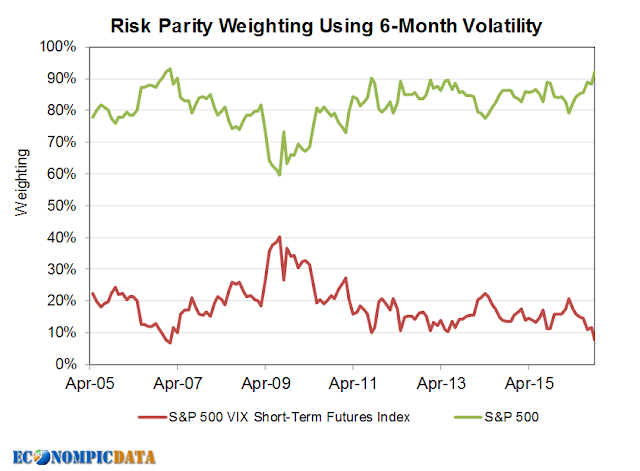 As a result, a strategy that consistently follows a set of diversified rules to allocate across factors may help reduce behavioral issues of holding onto a strategy that differs from the S&P 500. 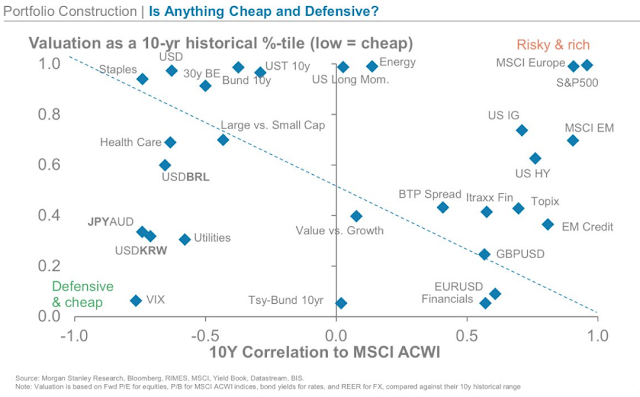 Given the historical performance of this sort of strategy tends to do relatively better when market valuations are expensive, it may be an interesting approach to allocate across factors going forward. UPDATE: I had a nice discussion with Alex Rampell, partner at VC firm a16z, who provided me with a material detail that I missed that is both positive and negative. I greatly appreciate his time and while it does change the value proposition for homeowners, it remains unclear to me that the new benefit outweighs the new cost for most homeowners. That said, with the new information I can see where a homeowner with a sizable equity stake could value the flexibility it may provide and I do see where this could become a viable product a few iterations down the line. I missed that Point does in fact share in the downside with the homeowner if the home price falls below Point's "risk-adjusted value" (and the loss has not eaten away all of the homeowners equity). Point places a risk-adjusted value on each home at the time they take a stake (i.e. if the home has a market value of $1,000,000, it sounds like they'll typically strike a risk-adjusted value at some price below that). Once the home declines below that risk-adjusted price, Point shares in the loss at their ownership stake (i.e. if they took a 10% equity stake in the home, they share in 10% of the losses below that risk-adjusted value). I would note that the risk-adjusted value is also an incremental cost to the homeowner that I initially missed. If a $1,000,000 home has a Point risk-adjusted price of $900,000 and is sold the very next day at $1,000,000, then it sounds like Point is entitled to a 20% cut of the $100,000 "gain" even though the market didn't move. 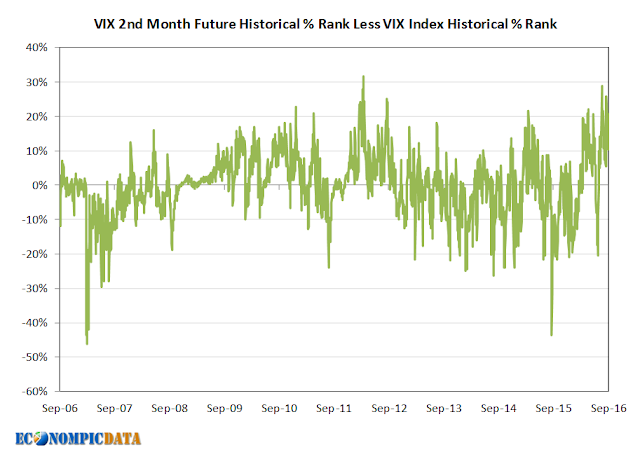 Where I personally can see this eventually being a viable product is for an individual that bought low (likely a long time ago), is now sitting on a house worth a LOT of money, and is liquidity constrained (i.e. cannot afford the monthly interest payments associated with a HELOC). Retirees planning to move in the next ten years (Point requires they are paid out of their equity stake within ten years) would be one demographic falling into this camp, as would technology folk who have been buying up property all over San Francisco when we hit our next tech recession (please please please happen sooner than later). My dialogue with Alex also made it pretty clear to me that the longer term goal of Point is to build a platform where all these details would more dynamically sort themselves out. 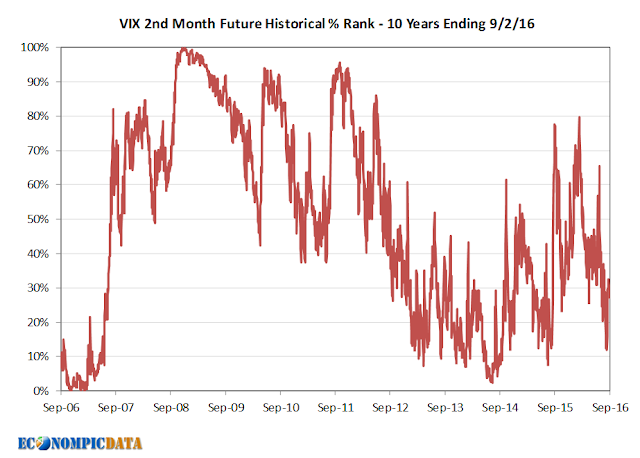 For now, the initial analysis below does understate the downside (i.e. 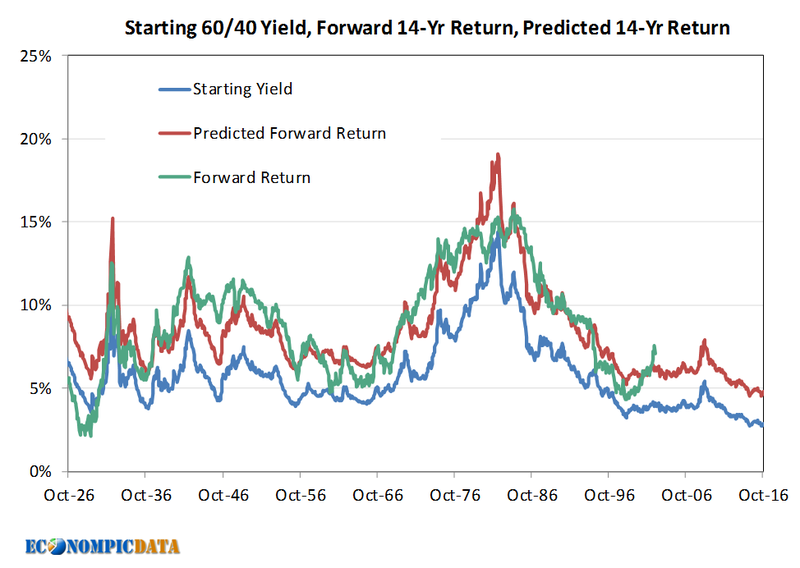 the amount captured by Point is actually higher given the risk-adjusted price), but also understates the upside (i.e. 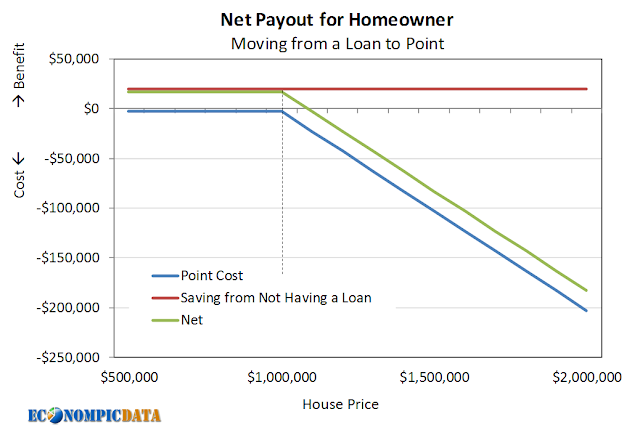 the homeowner can benefit by more than the interest savings if prices move lower). For those with a high LTV (loan-to-value), thus lower equity cushion, I believe the initial analysis remains a good enough proxy for the payout structure as the benefit of the put received (i.e. 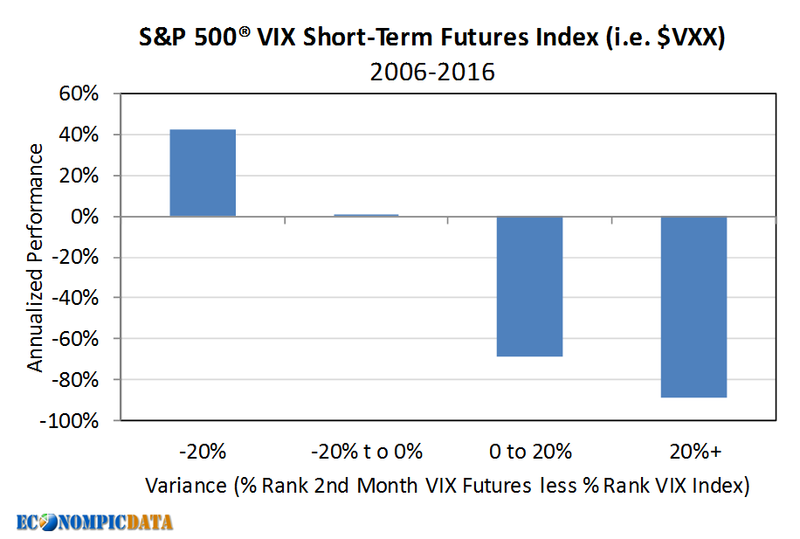 the loss Point offsets in a market decline) is only there until the total equity is wiped out (banks get paid back first). I am pretty sure there will be a ton of other posts tomorrow about Point (a "home equity partner") given the huge response to Marc Andreessen's tweet (if not... check out the responses here - UPDATE: the great Matt Levine has a take here). As a result, I'll skip whether or not the fractional home equity investor is really just a predatory lender, how they will / won't disrupt the mortgage industry, or whether it marks the VC top. Instead I'll focus on the investment case against swapping out of a traditional mortgage loan and "selling" Point a fraction of your home equity. I make a lot of assumptions in the below, but if anything looks off, please let me know. TLDR: don't do it. To be eligible for Point, you’ll need to retain at least 20% of the equity in your home after Point's investment. As a result, this is a pretty straight forward swap for a homeowner that is otherwise reliant on borrowing. The homeowner is simply swapping out the cost of interest payments for the opportunity cost of the housing appreciation associated with whatever equity stake is sold should markets rise. In the below analysis, I assume a $1,000,000 home where an investor swaps out 10% ($100,000) from a ten year interest only loan and instead "sells" that 10% stake to Point. Given Point gets paid back before the homeowner, this capital structure provides a huge benefit to Point at the expense of the homeowner (i.e. heads Point wins, tails the homeowner loses). There could be examples where Point also takes a hit, but the homeowner appears to have already been wiped out an amount equal to Point's stake at that point. 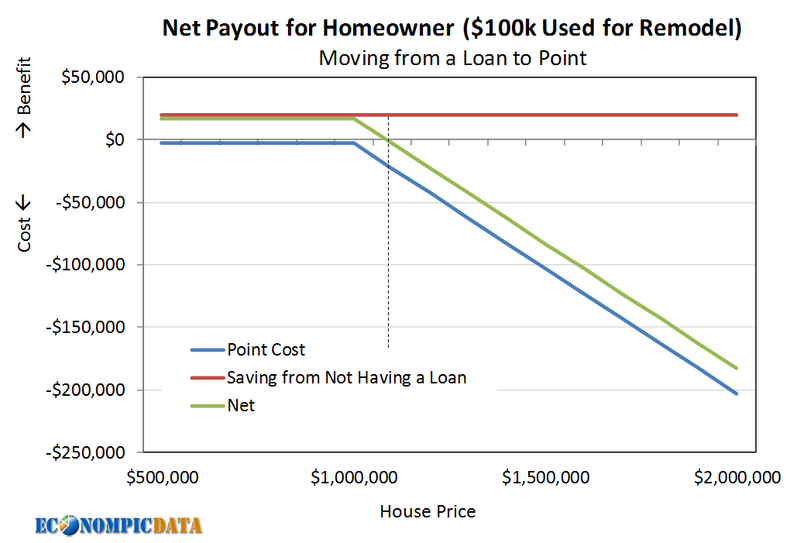 The below payout diagram assumes an investor doesn't pay back the loan for the max 10 years (the longest period of time before Point is owed their investment back) and that the increase in home value comes solely from market appreciation (i.e. no upgrades paid for by the homeowner). The dotted line represents the starting house price and we can see that the homeowner is better off if the price does not move or if the price declines, as they pocket the $20,000 they would have otherwise paid in after-tax interest. In return, the homeowners break even if the market rises a bit more than 1% a year, given the interest savings and 3-4% up front cost, a rate that is forecast to be less than the rate of inflation. Many homeowners use Point funds to pay for remodeling costs. You can remodel your home but there are limits on adding additional debt to the home to pay for remodeling. Please also note that Point will share in any increase in property value due to remodeling changes you might make. Let's be clear... if a homeowner sells a $100,000 stake in order to invest in a new kitchen, increasing the value of the home by $100,000, Point captures 20% of that $100,000. Note that $20,000 ($100,000 x 20%) equals the entire benefit of avoiding the interest payments for the full ten years, meaning there is no longer any net upside of choosing Point vs a loan at time = 0. The dotted line represents the new starting point assuming the $100,000 was used to upgrade the home (note the green line cross at ~$0). We get a value of roughly $60,000. Assuming any home price movement will be on top of 2% / year inflation, these calls move up to a rough value of $100,000. All for $20,000 in saving. Mike Mauboussin's latest write up Reflections on the Ten Attributes of Great Investors is a must read for investors (while his recent podcast with Barry Ritholtz is a must listen). And while I broadly agree with his ten main points, I thought it was worth discussing details / providing an alternative take to his main point under the section 'What's Next? 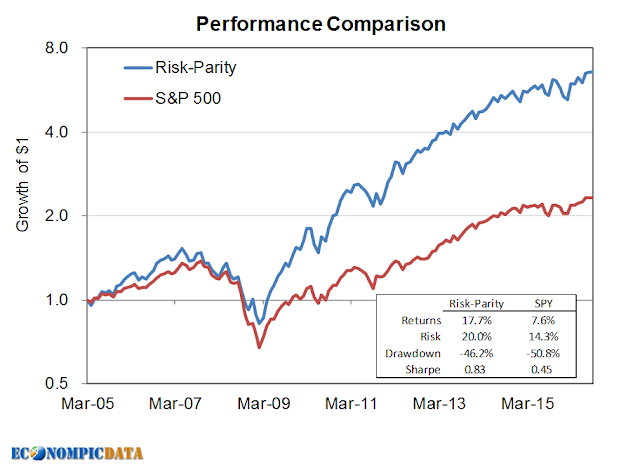 ', which touches on the impact passive / ETF asset growth will have on the ability for active investors to outperform. Thirty years ago, index funds were less than one percent of assets under management, and today they (along with other passive vehicles such as exchange-traded funds) are about one-third. Think of it this way: (1) For you to have positive alpha, the industry’s term for risk-adjusted excess return, someone has to have negative alpha of the same amount. By definition, alpha for the market must equal zero (before fees). So you want to compete against less-skilled investors because they are your source of alpha. 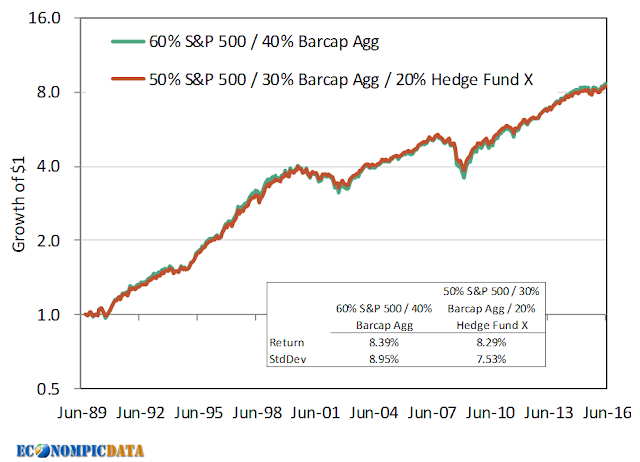 (2) It is disadvantageous for you if the weak players flee the market (selling their stocks and buying index funds), or if the least capable professional investors lose assets to passive funds, because it means that only the smartest investors remain in the active game. The truth is that weak players, whom the strong players require to generate excess returns, are fleeing at a record pace. To paraphrase, (1) the market is a zero sum game (relative winners only exist if there are relative losers) and (2) less skilled investors are going passive, resulting in the amount of negative alpha available for remaining investors shrinking. 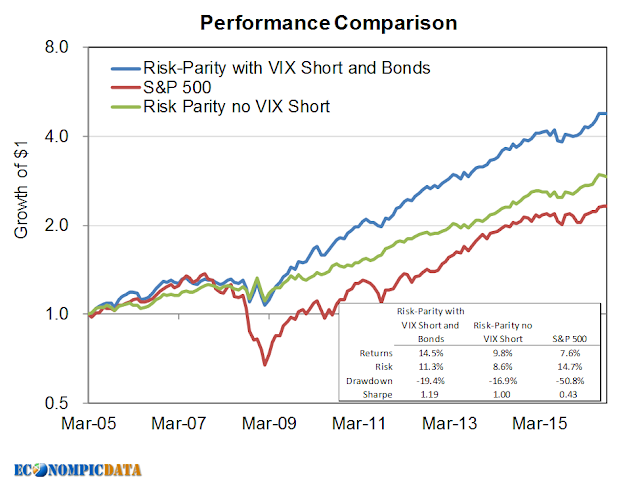 Is the Market a Zero Sum Game? Yes and No. I agree with the view that the market is zero sum when looking at dollar-weighted performance (i.e. if everyone is fully invested and there are no flows, then if some investors are up relative to the market, then others must be down, resulting in net returns equal to the market less fees). BUT investors are known to be horrific market timers, regularly underperforming the return of the funds in which they invest. As a result, the negative performance gap between the performance of funds / ETFs and the performance of investors can be captured by fund managers and/or investors, meaning that it is theoretically possible that all funds outperform their benchmark, while all investors underperform the funds they allocate to (the zero sum nature should be viewed in time-weighted performance across all asset categories, rather than dollar-weighted performance within one category, as flows exist in the real world). This was the essence of my favorite investment read of 2016 Active vs. 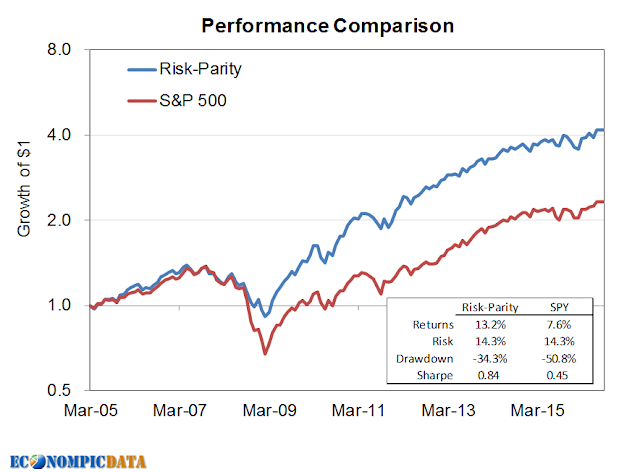 Passive Investing and the “Suckers at the Poker Table” Fallacy. Are There Less Weak Players in the Market When They Go Passive? Sure Doesn't Seem So. Weak players may simply be making poor investment decisions elsewhere. The chart below shows the performance of mutual funds and ETFs across a variety of U.S. styles (growth, blend, value), as well as market caps over the last five years per Morningstar methodology as of June 30th, 2016. Note that I think the total return and investor return calculation used by Morningstar is flawed* (see footnote below), but it is the only source I am aware and is used (fairly or not) throughout the industry (so I'll use it here, but if readers have a better source let me know). 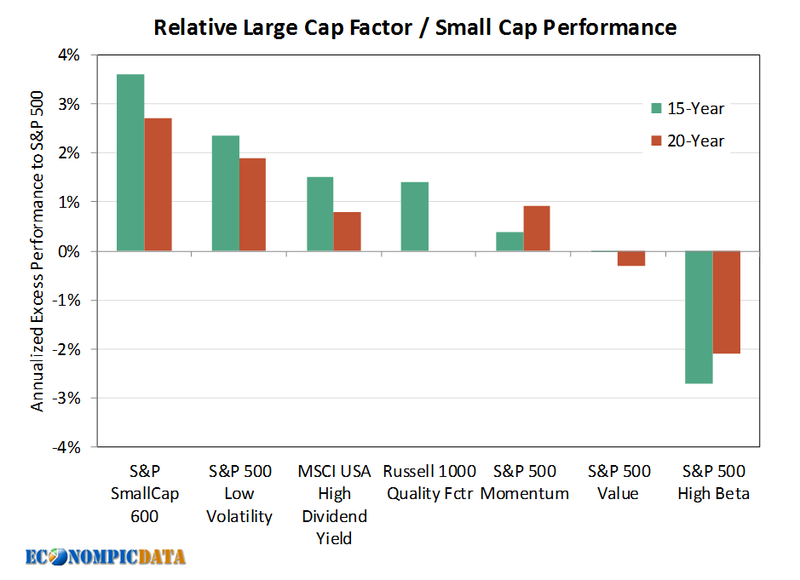 Note that ten year data was unavailable for 4 of the 6 ETF categories, though reported investor underperformance was similar in scale for large blend and large value. Using this calculation, the average total return of ETFs was higher than mutual funds across categories over the last five years, BUT ETF investors massively underperformed both the return of the ETF and the investor return of similar style mutual funds over the same time frame. 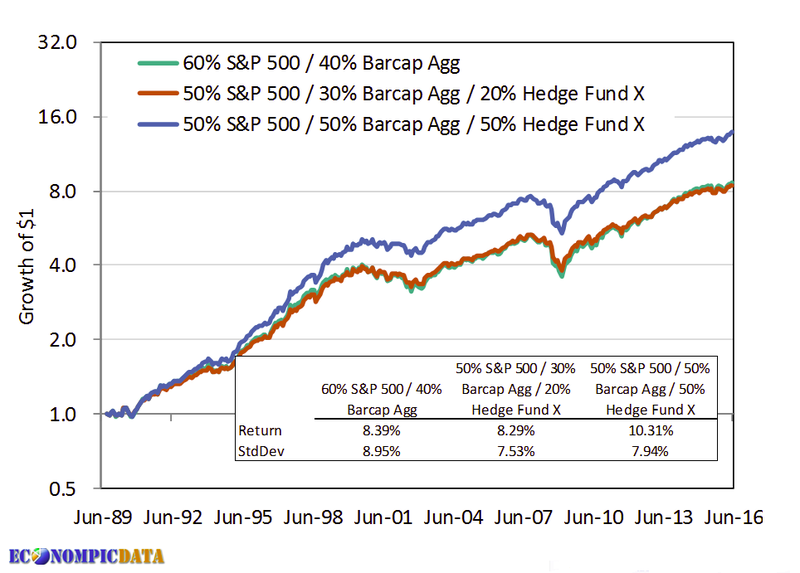 Investor returns in the chart above would indicate ETFs have seemingly ADDED to the alpha pool within these plain-vanilla categories, which does not include the more esoteric asset classes / structures that have already removed billions of dollars of investor capital from their wallets. 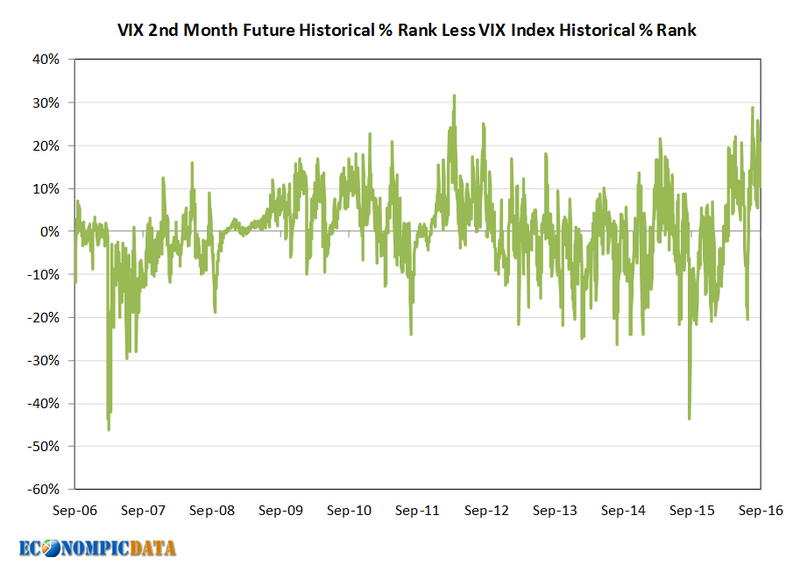 As a result, the poor timing by ETF investors may make more alpha available for those institutions and investors that can act as a counter to this poor market timing. 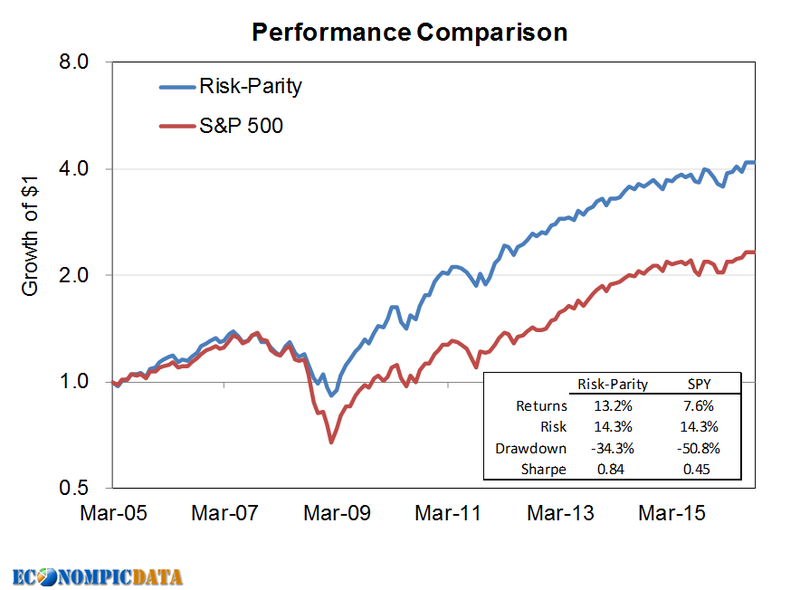 But given most investors have underperformed within mutual funds as well, where has all of this excess performance gone? I need to think more about what I am going to say next, but what if it is has gone to the companies themselves in the form of stock appreciation and senior level stock compensation? 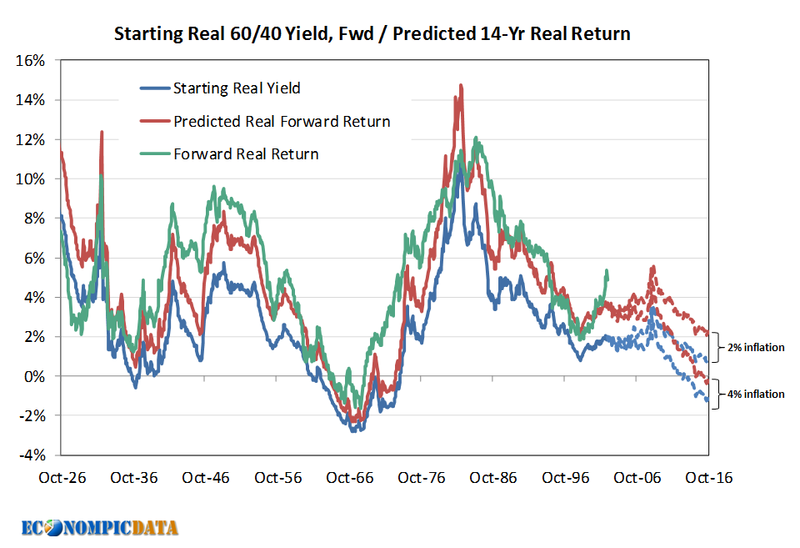 If investors have been poor timers this cycle, then perhaps companies that have consistently bought back their own stock have been good market timers? I believe there are a lot of issues with Morningstar category total return calculations, as well as Morningstar category and fund investor return calculations. Category total return calculation: see here for their methodology, but in a nutshell the calculation averages the total return for each fund within each style universe irrespective of asset size and benchmark; a tiny fund with poor performance holds as much weight as a huge fund with outperformance. 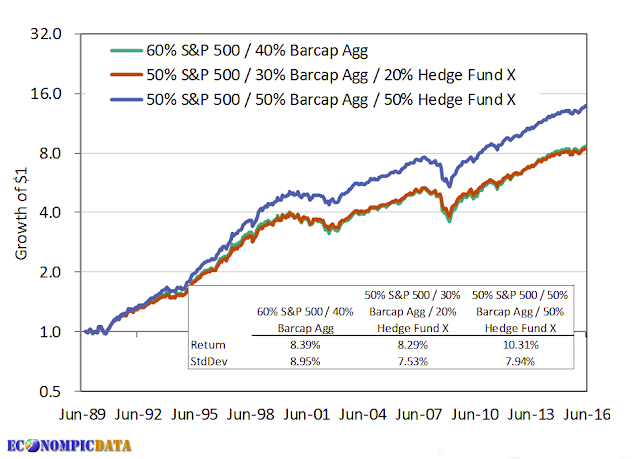 As a result, it is theoretically possible for the average dollar weighted investment in funds to outperform the index even if the category underperformed. 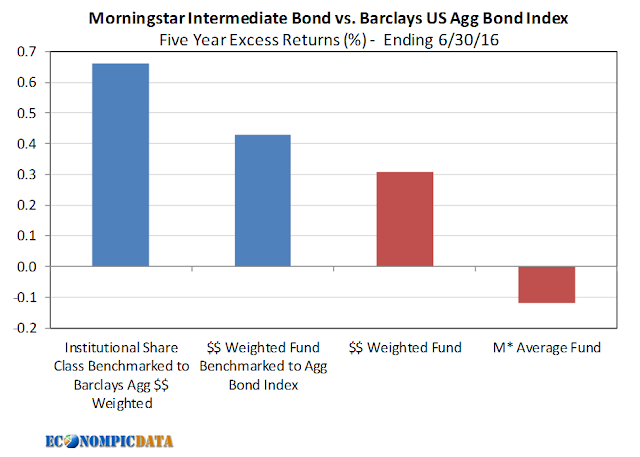 As is the case of the Morningstar Intermediate Bond category… for the five years ending 6/30/16, the average fund underperformed the Barclays Aggregate Bond Index. 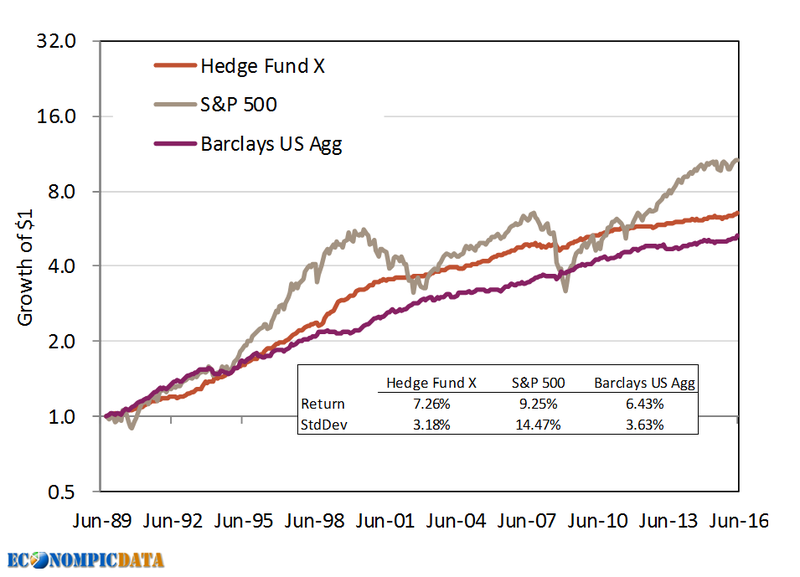 BUT, the dollar weighted fund return outperformed the index and funds benchmarked against the applicable Barclays Aggregate Bond Index outperformed the index further. 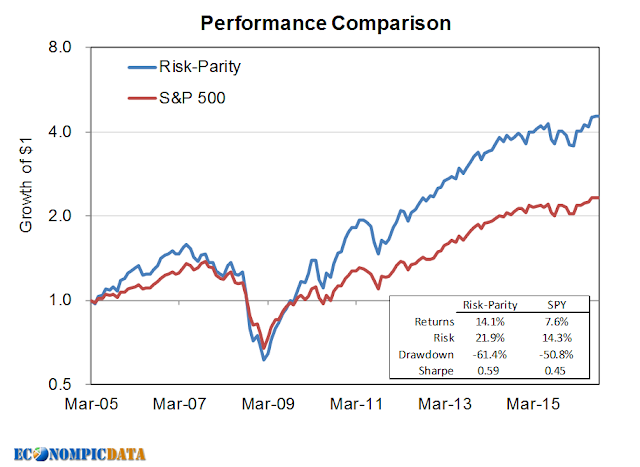 Narrowing the focus to institutional share classes added another 20+ bps to excess performance. Note in this analysis I used the most recent share class AUM, which may overstate the relative performance given investor performance chasing (i.e. 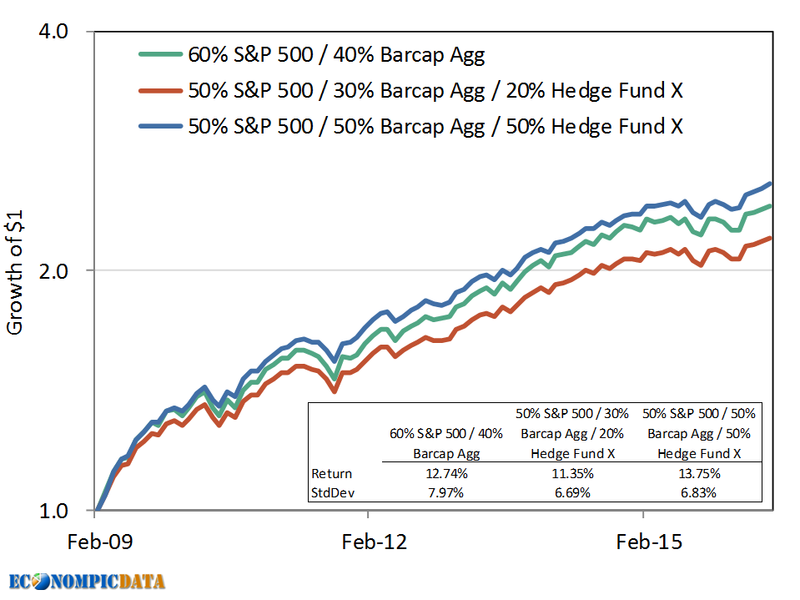 AUM is likely overstated for the best performing funds). Investor return calculation: I've written about the issue of comparing time weighted and asset weighted returns previously. 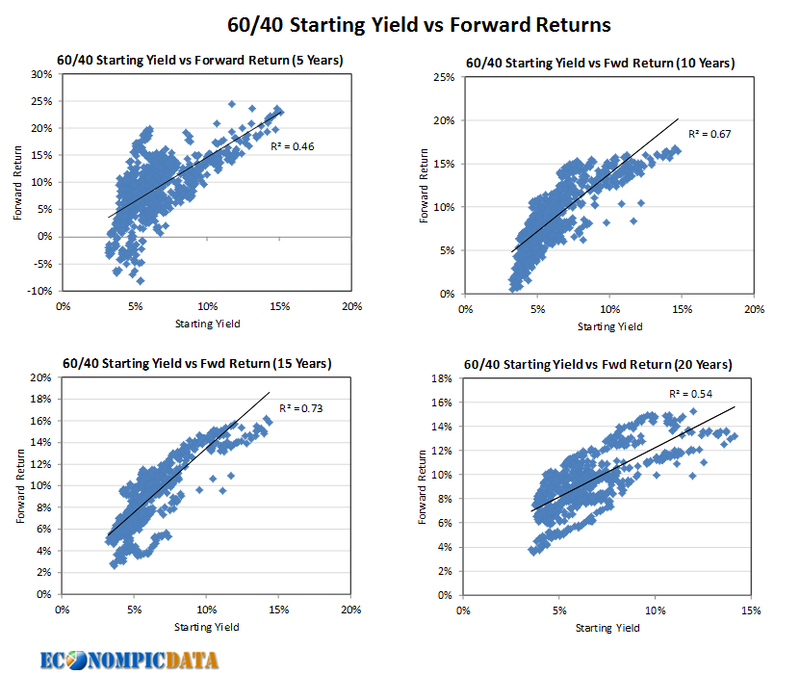 There is an additional issue, similar to the one within the total return calculation outlined above, which is the calculation seems to average the investor return for all funds in each category. 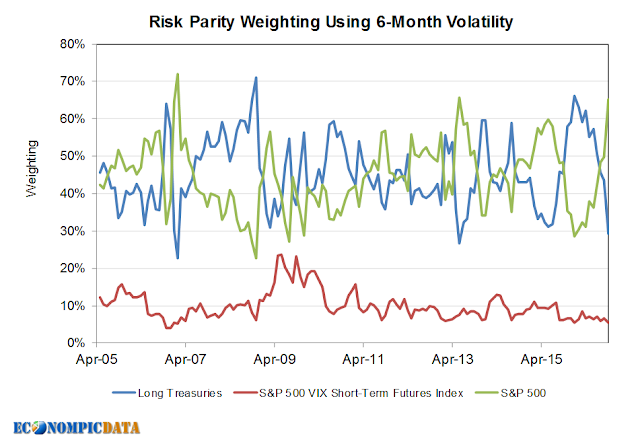 As a result, a tiny fund with tiny poorly timed flows may have an oversized impact to the category average. For example... if a $10 million fund received a $5 million outflow, which was then allocated to a much larger fund, the investor return of the small fund could be severely impacted by the outflow, while having an immaterial impact to the larger fund. Averaging the two at a 50/50 weight would mean the flow could have a huge impact to the category average, while being a wash in reality. Finally... investor returns for ETFs also seem to include flows related to short investors / hedgers within these ETFs, but my view is this is less of an issue as shorts that underperform still add alpha to the overall "alpha pool" in a zero sum world (i.e. shorts / hedgers that lose money have negative alpha... a boon to other investors). 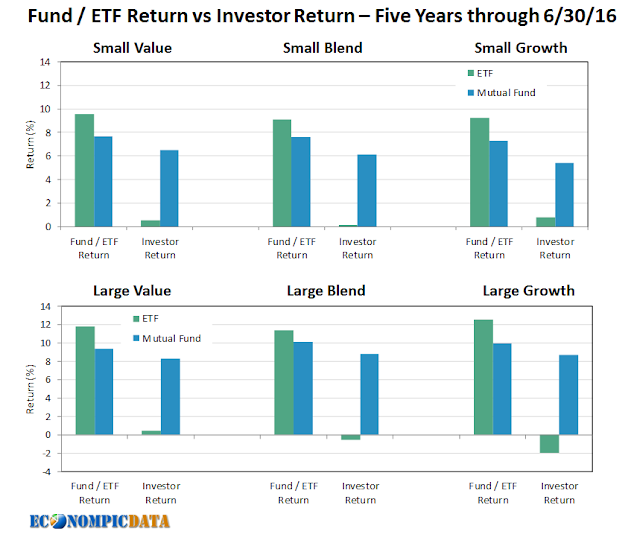 Smell Test: In terms of whether the direction of the investor returns looks right, I did take a look at flows and returns within the Large Blend ETF category going back five and ten years. 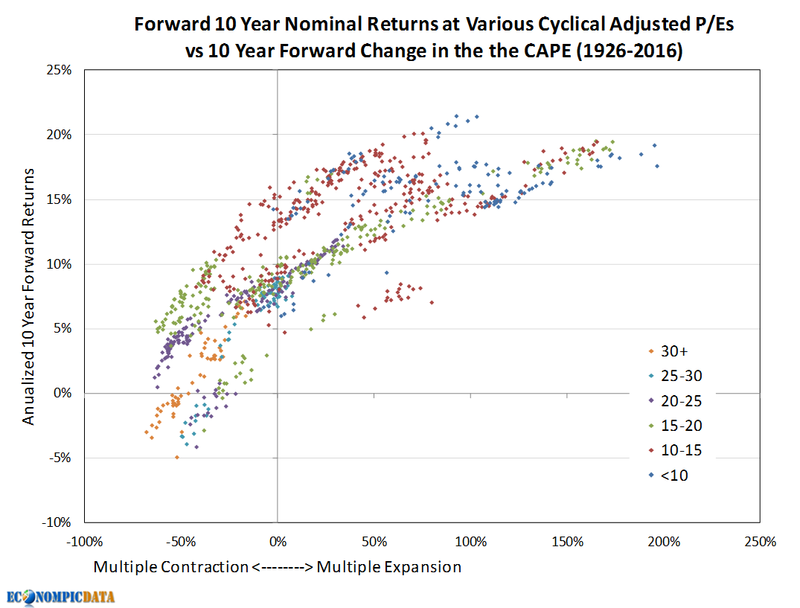 Over the last ten years, the slope of the regression between 12-month flows and the 12-month historical return was positive 10x (i.e. 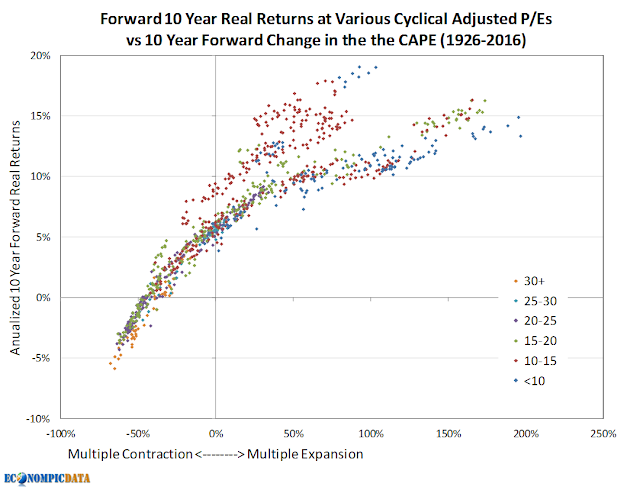 if returns were -10% in the previous 12-months, then the regression assumes outflows of -$10 billion over that same window). 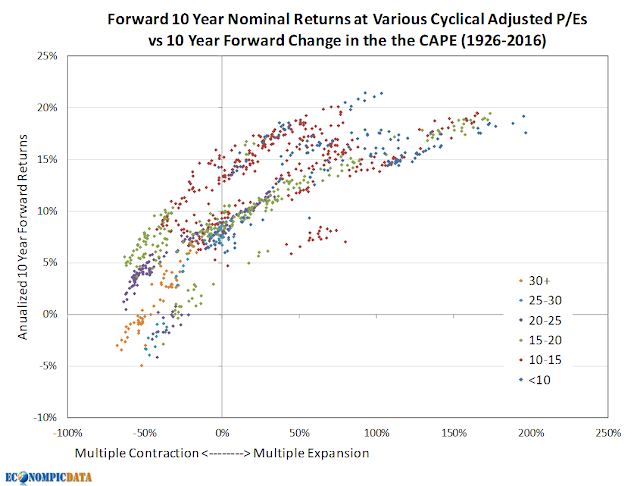 On the other hand, the slope of the regression between 12-month flows to the Large Blend category and 12-month forward returns was negative at -10x (i.e. 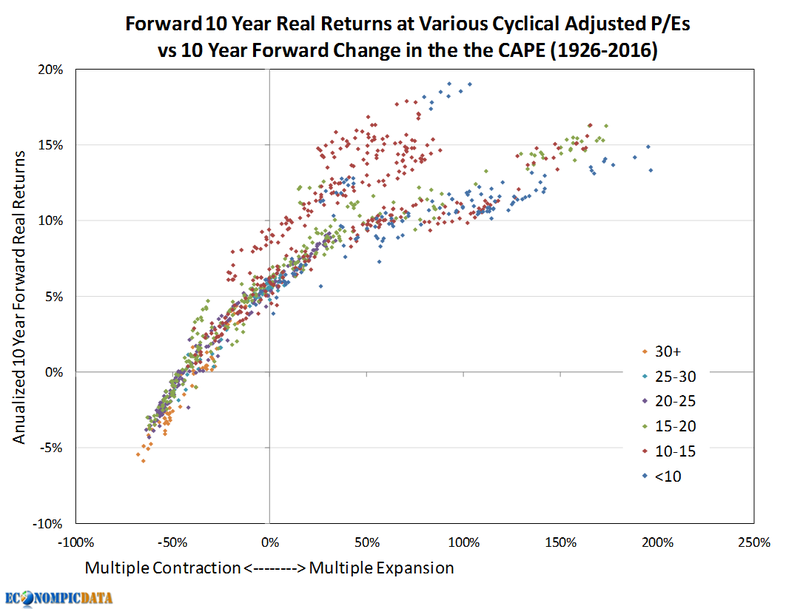 if flows were -$10 billion, then the slope of the regression assumes future returns were positive 10%). 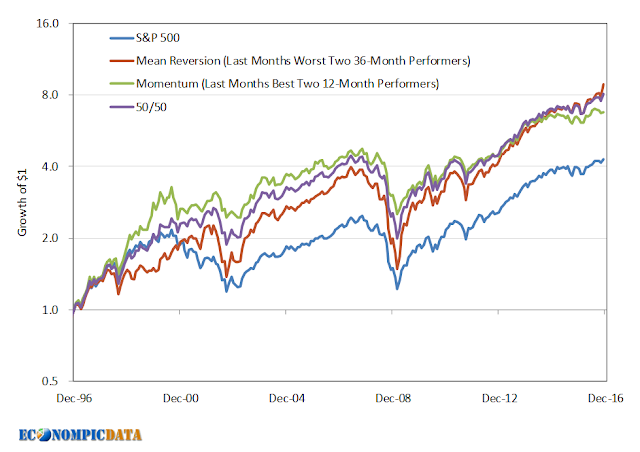 In other words, investors zigged after markets zigged, then markets zagged, which would lead to poor investor returns. What if Factors Rarely Matter? Back in December I wrote that It's Generally Smart to Avoid Credit Risk outlining that more than 100% of credit's excess performance over time has come when the level of credit spread was extreme. 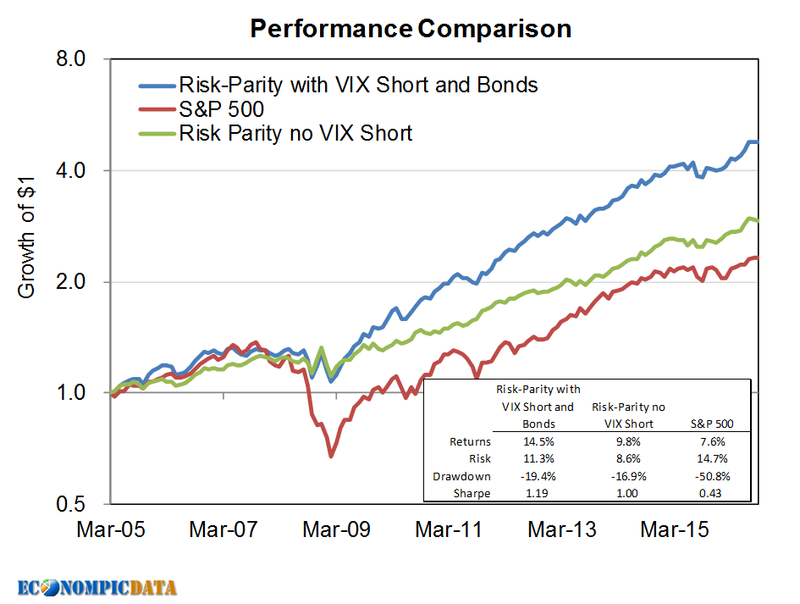 What if the same were true for well known investment factors? 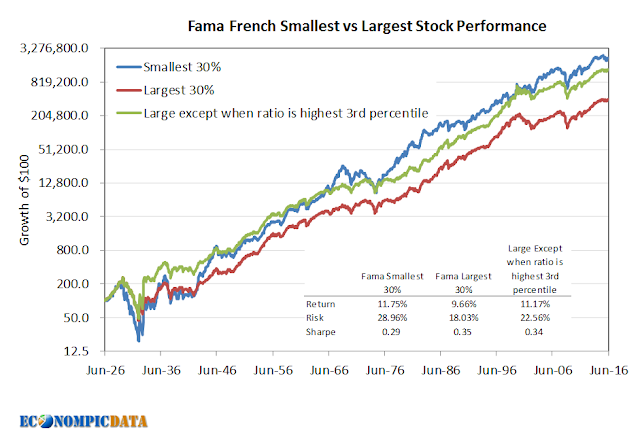 The chart below takes the average market cap of the 30% largest companies within Fama French data and divides it by the average market cap of the 30% smallest to form a ratio. 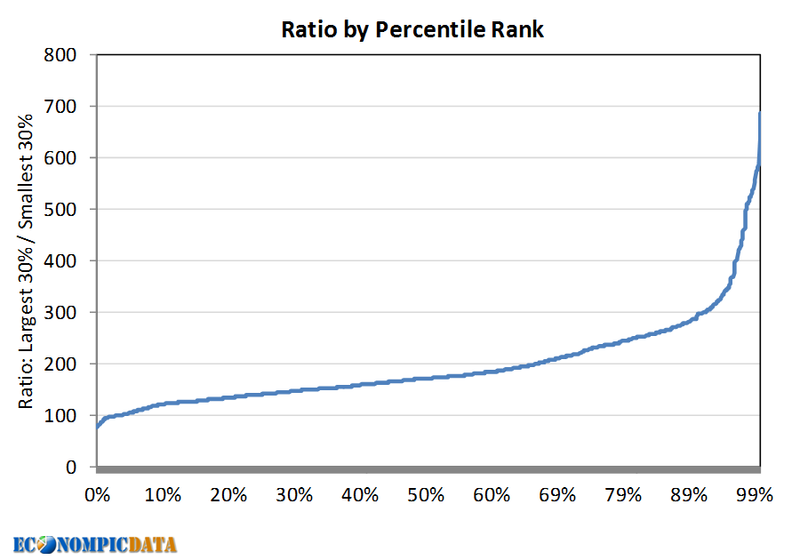 The next chart takes the above ratio and ranks them by percentile. For example, the 50th percentile is a 172x ratio, which is slightly above the current 148x ratio. Now is where things start to get interesting... taking the ranks in the above chart and plotting the average excess small cap forward performance by starting decile bucket (i.e. all ranks 0% to 9.99% are within bucket 0... 10% to 19.99% are within bucket 10....etc...), we can see a definitive pattern. When the ratio is low (i.e. there is not a large gap in the market cap between small and large firms), there is perhaps only a minimal opportunity for small companies to catch up to large caps leading to small cap underperformance given their higher risk; when the gap is high, there is perhaps a lot of room to catch up - leading to small cap outperformance. 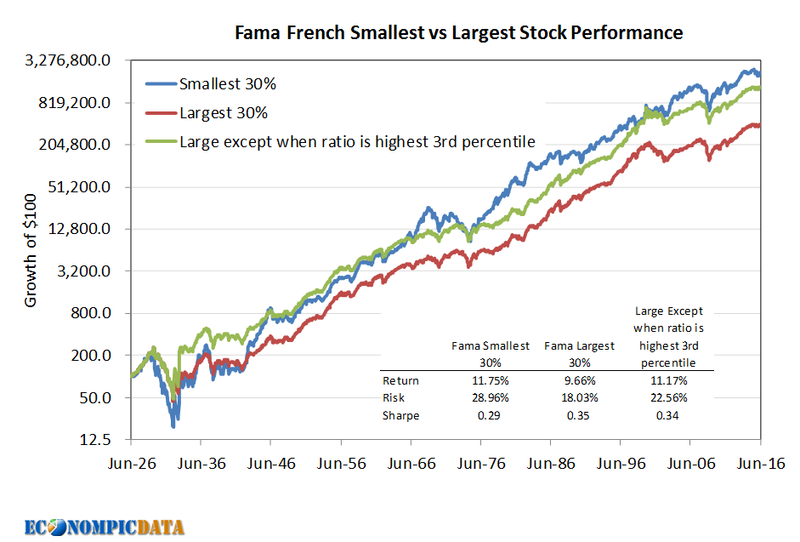 The next chart shows the stand-alone forward performance of small and large stocks within the same buckets as the chart above, rather than the variance between the two. 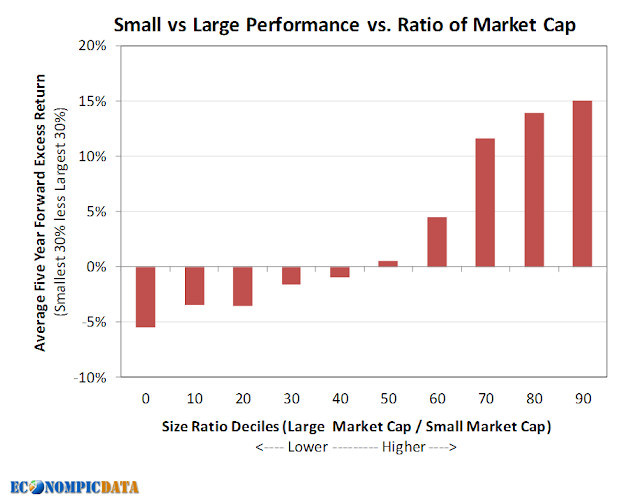 Note the relative performance by market cap ratio has been driven mostly by the performance (bad and good) of small caps when the ratio is low or high, rather than the performance of large cap stocks. 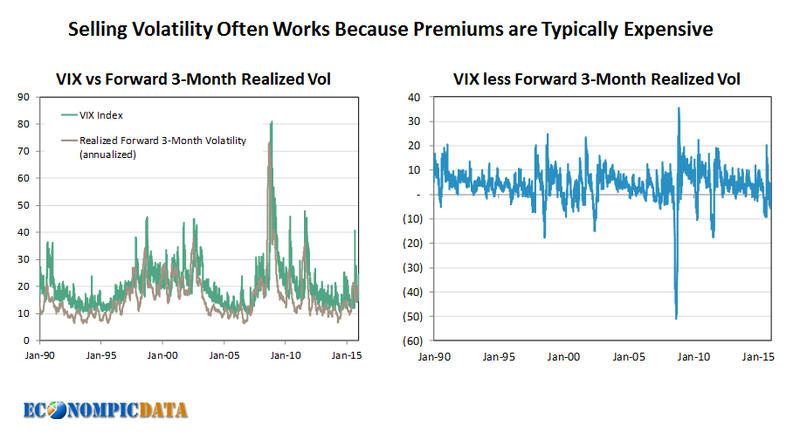 Potential Implication: What if Extreme Gaps Drive the Whole Premium? Now is where I believe things get very interesting. An investor making an allocation to large stocks in 97% of all instances (i.e. making an allocation only when the market cap ratio was north of 425x which marks the highest 3% of all instances and only includes a portion of the Great Depression and the Internet Bubble), would have received 75% of the small cap premium since 1926 with significantly less volatility. 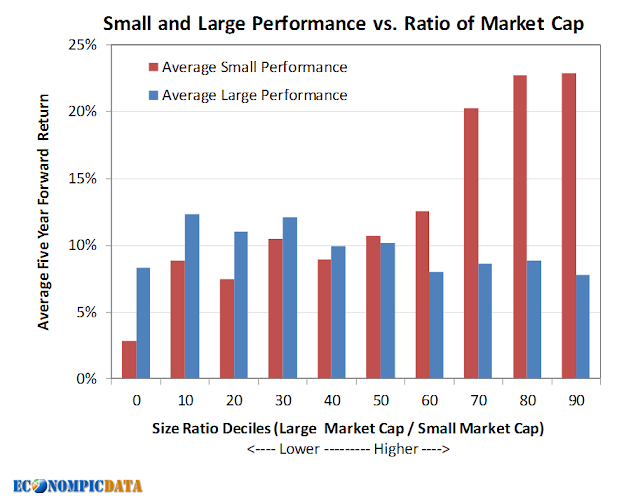 An investor making an allocation to small caps only when the month-end ratio was north of 175x (the median) would have done even better than small cap stocks alone, returning 13.1% vs. the 11.8% of small caps since 1926. Additional analysis is needed before any claims can be made, but if investment factors generally lead to consistent excess performance only at extreme levels, it questions the benefit of having a strategic allocation to these factors irrespective of the market environment. Bob Seawright of the great blog Above the Market, recently put together a consolidated list of his past posts which was a great way to find his older work. I thought it might be similarly helpful for new and old readers alike if I provided a list of links to various posts from EconomPic since coming out of blogger retirement just about a year and a half ago (I had more posts than I thought). For those interested in a consolidation of the below EconomPic posts (as of March 2016) in an easy to read / printable pdf, please sign up with your email should you come across a pop up banner when visiting the blog or shoot me an email at econompicdata@gmail.com. Thanks for the support! From Momentum to Mean Reversion: What the Heck Happened?